An Amazing Vintage Art Deco Handmade Platinum (stamped) Engagement ring dazzles with EGL USA Certified 1.30ct NATURAL Round Shaped Pink Sapphire. The measurements of the center stone are 5.91x5.81x4.36mm. A one of a kind HANDMADE Platinum setting features 6 small old cut diamonds on the shoulders, estimated total is 0.06ct; H-I color and VS-SI clarity over all. Beautiful Engraved design underneath stone and on the band. 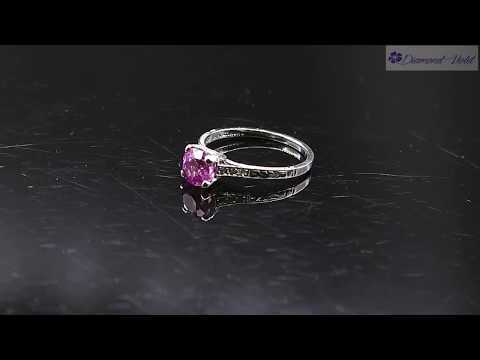 The 14k White Gold prongs and Pink Sapphire re possibly added later years. Sits medium to low from the top of the finger: 6.18mm. Finger size 5 1/2, can be sized. FREE SIZING with purchase. The weight of the ring is 2.6 grams, nice and Solid. The band tapers from 1.73mm to 1.35mm on the bottom. Condition: Great original Vintage condition, minor evidence of wear in form of tiny scratches to the metal. Consistent with age, Unique and Ready to wear! Comes in the Gift Box with Original EGL USA GEM Passport and an Appraisal.